Captain Brudnicki offers the following programs  all of which can be tailored to fit your audience. This half day session will use case studies and examples from your company or organization to see the 7 Step Risk Management Ð Decision Making process in action. Audience members will gain hands-on experience assessing risk by using examples pertinent to their jobs. Participants will learn to become more comfortable making difficult decisions even in situations they can't control or when they don't like their options. 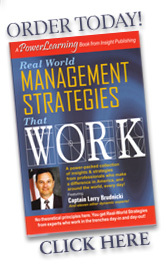 If you're ready to achieve a positive return on your investment, book Captain Larry Brudnicki today!